Best Buy’s Q3 earnings will be announced were announced on Thursday, November 20th before the opening bell (much to the chagrin of the Argus Insights publishing schedule). 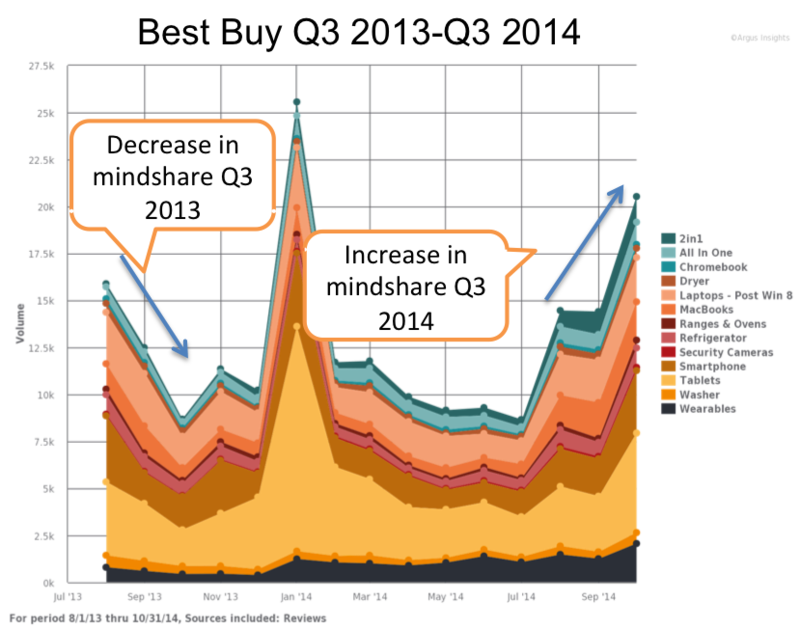 Best Buy’s consumer review mindshare in Q3 of 2013 saw a sharp decline, while mindshare in Q3 of 2014 saw the opposite. After a slow summer, consumer review volumes shot up in August 2014 with continued growth throughout the entire quarter. Tablets, smartphones, and laptops received the most attention, but other sectors, like wearables, are beginning to contribute to the company’s increasing mindshare as well. Over the past year, Best Buy has been implementing ‘experience stores’ within their larger store, that are specifically focused on brands such as Apple, Samsung, and Intel. The targeted attention of these experience stores appears to be translating into increased consumer demand in Best Buy consumer electronics. Consumers were more interested in Best Buy products throughout the quarter, and this boost in attention will most likely translate to reported gains in Q3. Comparing the trajectory of Best Buy’s consumer review volumes to that of Amazon further highlights Best Buy’s vast improvement in Q3 performance this year. 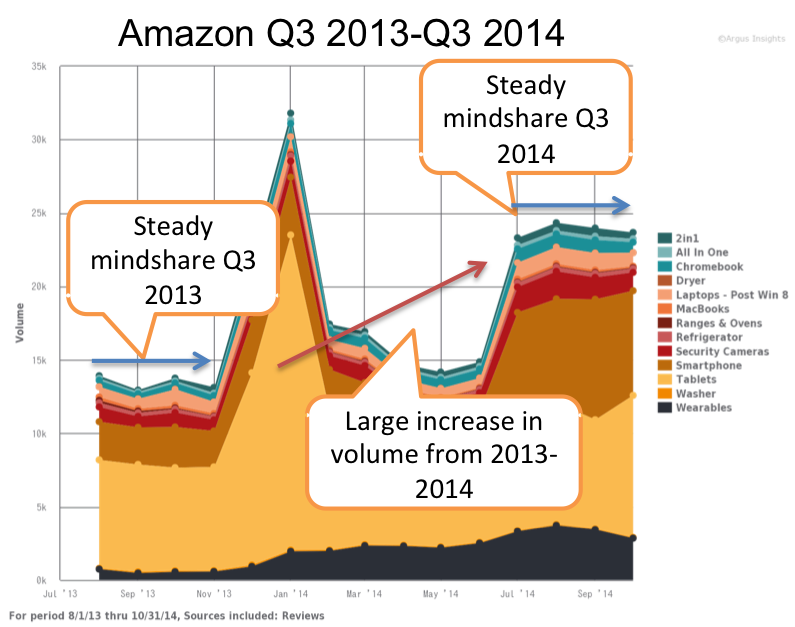 Amazon saw higher volumes of reviews, but with a sustained trajectory. These shifts in relative review volumes are a key indicator of sales trends for retailers. 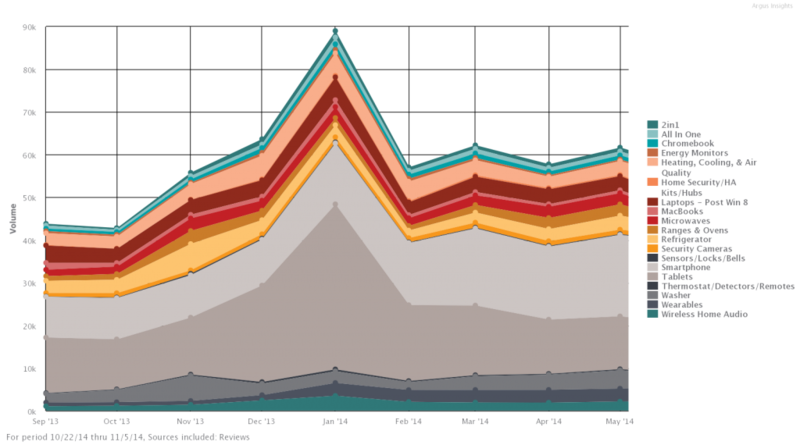 Amazon’s growth is in large part due to the release of new Amazon Fire Tablets (yes, they dropped the Kindle assuming we’ve already ignited our interest in their products and do not require kindling) though even without tablets, we see Amazon’s growth over the same time period in 2013. Best Buy saw a complete transformation in consumer engagement during Q3 of this year. 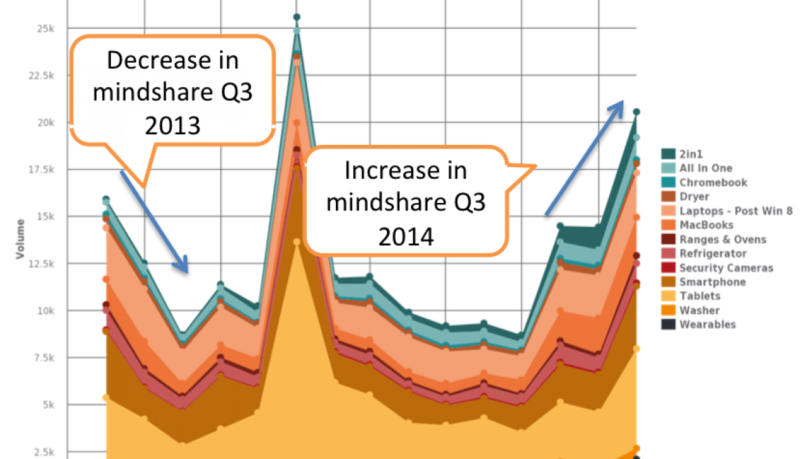 This increased mindshare suggests that Best Buy will see sales growth for the quarter. (Editor note: Looks like we were right, they beat the street’s expectations). Amazon still has overall higher growth year to year, but Best Buy has reversed the downward spiral of last year, fending off rumors of “death by showrooming.” We will keep watching through Black Friday’s frenzy and the rest of the holiday season and update the market just before their earnings releases in February. Argus Insights tracks several product categories across various retailers. Please contact us for custom reports, access to our data, or personal consultation. If you are interested in a monthly report on the effects of consumer demand within the Wearables or Smartphone Market, check out our Monthly Market Analysis Reports. For just a Wink of insights to remain informed between blogs and reports, sign up for our Free Weekly Newsletter. Since its release on September 5th, early Moto 360 smartwatch adopters have been delighted. 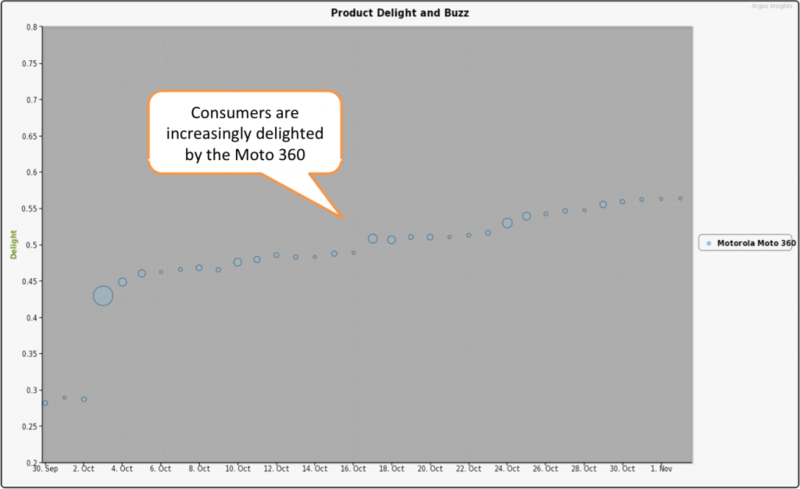 Delight scores soared throughout the month of October, demonstrating persisting consumer satisfaction. In fact, the initial success of the Moto 360 drove Motorola to be the most loved wearables brand of October. The praise for the style and design of this round smartwatch overpowered complaints of performance and battery life to drive overall consumer satisfaction. 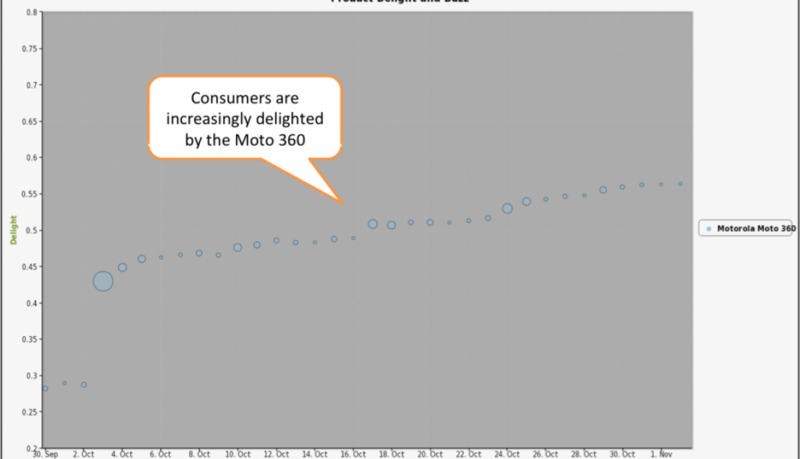 The reasons behind the positive consumer reception and subsequent success of the Moto 360 launch are examined in detail in the Product Deep Dive section of Argus Insights’ October Wearables Peek Report. For more details about why the Moto 360 experienced such a successful launch, check out our October Peek Report. Motorola was October’s ‘Brand to Watch,’ so Argus Insights drilled into the consumer experience to pinpoint specific reasons for the Moto 360’s success. In addition to the deep dive on the launch and reception of the Moto 360, our October Wearables Report provides a close look at why consumers are adopting certain brands and products in the Wearables Market and examines the effect the anticipation of the Apple Watch is having on the entire market. The report includes brand and retailer rankings based on consumer reviews, with a detailed look at the reasons behind consumer adoption to determine what brands are doing right, and where there is room for improvement. The customer is always right, and Argus Insights is here to listen for you to deliver detailed, actionable insights. Purchase our October Consumer Demand Report for the Wearables, Home Automation, or Smartphone market today! Please contact us with inquiries about specific brands or products, custom reports, consultation, or to gain access to our data. For just a Wink of Insights to keep you informed between reports and blogs, sign up for our free weekly newsletters. OnePlus is a smartphone manufacturer that exclusively sells its bargain high-end One Plus One. This phone is only available for purchase with an invitation, but that has not stopped 500,000 consumers from purchasing it over the past 8 months. OnePlus has grown a solid base of promoters by providing a quality phone at a good price (they only make $10 profit per handset) and despite a limited inventory and weak supply chain, “Android fans have been clamoring for the limited invites” to purchase the OnePlus One. 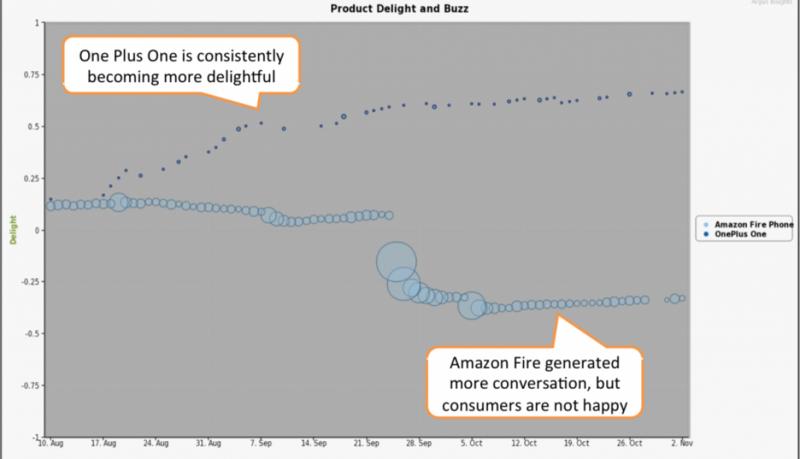 This Cinderella story juxtaposes curtly with Amazon’s failed launch of the Fire Phone. The differences in success can be attributed to the vast dissimilarity in consumer experience. While both handsets were the sole smartphone launched by each manufacturer, the sparse OnePlus early adopters were delighted by a surprisingly cheap, capable handset, while Amazon Fire Phone adopters paid a whole lot for a Pandora’s Box of problems. 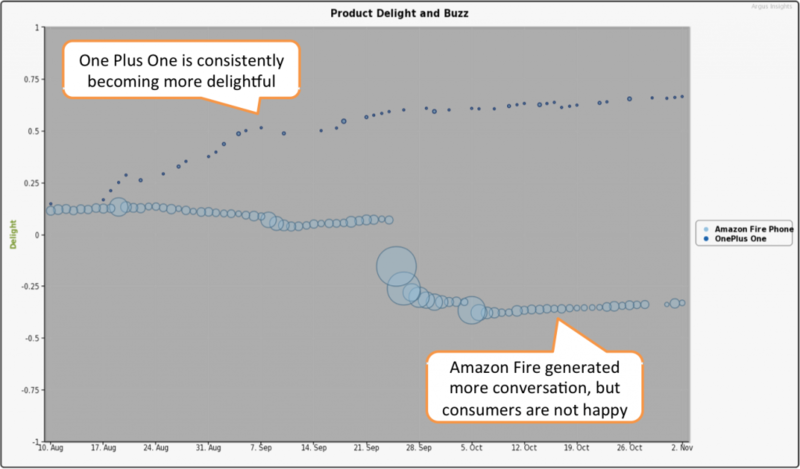 Consumer reaction to these respective launch journeys is captured in the graph below. 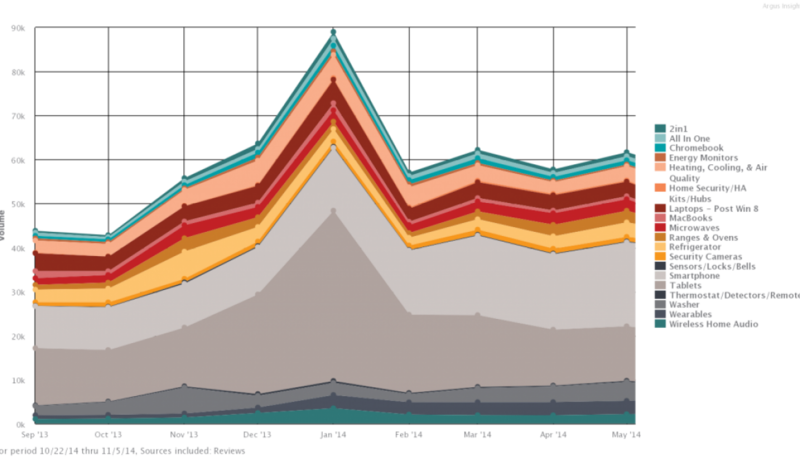 Delight around the OnePlus One slowly increased even though buzz volume remained fairly low, while consumers became less delighted by the Fire Phone as more and more people talked about it. 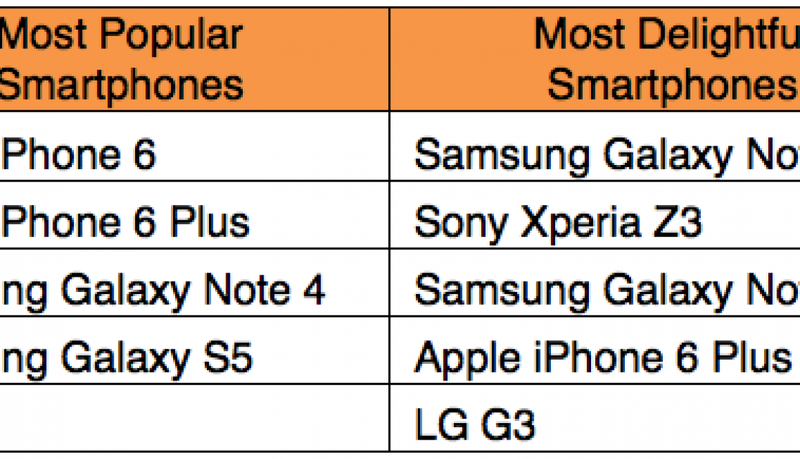 So how did the previously unknown OnePlus beat the most popular retailer on the block in smartphone sales? They are building their “brand around bargain hardware and online buzz,” driven by a quality product that pleases their customers. Brand awareness can attract consumers, as it did initially for Amazon, but if they are not delighted, early adopters are destined to become the only adopters. OnePlus is taking advantage of happy customers to develop as a company despite limited supply and lack of initial profit. They plan to sell 1 million OnePlus One phones by the end of 2014, and Argus Insights will continue to track their progress. To learn more about where OnePlus and Amazon fall in the smartphone market according to consumers (spoiler alert: OnePlus was the most delightful brand of September), take a look at our Monthly Smartphone Reports. If you want just a WinkTM of insights to keep you informed between blogs and reports, sign up for our Free Weekly Newsletter. Argus Insights provides individualized analysis, custom reports, personal consolation, and data access for several sectors of consumer technology, appliances, home automation, and more, please contact us with specific inquiries.